"BUN" redirects here. For other uses, see Bun (disambiguation). Blood urea nitrogen (BUN) is a medical test that measures the amount of urea nitrogen found in blood. The liver produces urea in the urea cycle as a waste product of the digestion of protein. Normal human adult blood should contain between 10–50 mg/dL of blood. Individual laboratories will have different reference ranges as the assay used can vary between laboratories. BUN is an indication of renal (kidney) health. The normal range is 1.8–7.1 mmol/L or 6–20 mg/dL. The main causes of an increase in BUN are: high protein diet, decrease in glomerular filtration rate (GFR) (suggestive of renal failure) and in blood volume (hypovolemia), congestive heart failure, gastrointestinal hemorrhage, fever, and increased catabolism. Hypothyroidism can cause both decreased GFR and hypovolemia, but BUN-to-creatinine ratio has been found to be lowered in hypothyroidism and raised in hyperthyroidism. The main causes of a decrease in BUN are severe liver disease, anabolic state, and syndrome of inappropriate antidiuretic hormone. Another rare cause of a decreased BUN is ornithine transcarbamylase deficiency, which is a genetic disorder inherited in an X-linked recessive pattern. OTC deficiency is also accompanied by hyperammonemia and high orotic acid levels. 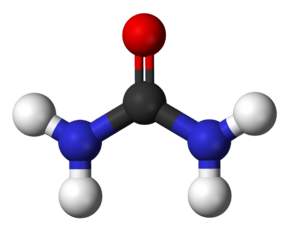 BUN (urea-N) is mg/dL in the United States, Mexico, Italy, Austria, and Germany. Elsewhere, the concentration of urea is reported as mmol/L, generally depending on the lab. ^ Last page of Deepak A. Rao; Le, Tao; Bhushan, Vikas (2007). First Aid for the USMLE Step 1 2008 (First Aid for the Usmle Step 1). McGraw-Hill Medical. ISBN 0-07-149868-0.